It's hard to believe that July 4th is right around the corner! Time to make plans for the celebration. We love spending the 4th of July with friends. Their neighborhood has a big block party- great music, tempting foods, and lots of fun for everyone. Of course, the night is capped off with a magnificent fireworks display. This year, my boys will be wearing their new outfits from The Children's Place. I have been a fan of The Children's Place clothes for many years. I appreciate the great quality (What mom doesn't appreciate clothing that will last through many washings and still look brand-new?) and affordable prices, and my kids love the trendy style of the clothes. When I was approached about doing a review of some summer clothes, I eagerly accepted. 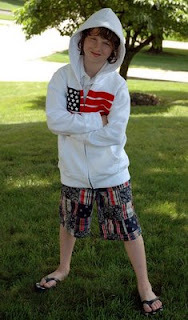 Ian was sent the Americana patchwork shorts, the Americana hoodie, and flag flip flops. The patchwork shorts are fantastic! Ian loves plaid and patchwork shorts, so these are perfect for him! In fact, he said they fit so well and are very comfortable, so he wants to wear them everyday. I appreciate the adjustable waist which allows us to keep the shorts fitting comfortably for Ian. The Americana hoodie is stylish and constructed of a soft cotton. I only wish it weren't white. White clothing + my boy at a barbeque = laundry nightmare for me! Honestly, though, I love this hoodie because even after I washed it, it didn't shrink. The flag flip flops are adorable! I only wish I could pick up more for the local store, but unfortunately, they were a hot item, and our stores are sold out. Ian tells us that they are the most comfortable flip flop he's ever worn! 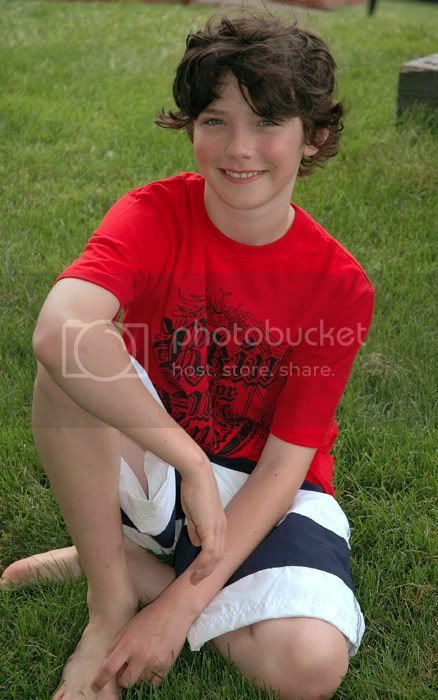 Jacob was sent Freedom swim trunks and a Rock Out graphic tee. The Freedom swim trunks are perfect for Jake. He looks great in the navy and white stripes. I like the durability of the material which I have come to appreciate from The Children's Place. The Rock Out tee is one of my favorite items. I love the graphic design- so stylish! The material is soft and a great medium-weight. Once washed, I noticed that it did not shrink at all. Now that it has been washed several times, I haven't noticed any fading at all. This tee is a terrific quality shirt. Right now, The Children's Place is having one terrific sale! Head on over to your local TCP for terrific savings and some amazing clothing! If you don't have time to get to a store, shop their website. Shipping is only $5.00! To celebrate the opening of SIX new stores in Texas, The Children's Place has generously offered one living life one day at a time reader a chance to win a $25 gift card. • Visit The Children's Place website and then post here and tell me how you will choose to spend the money if you win this prize. ENTER DAILY!!! Once you post your initial entry, you can come back daily and tell me you want another entry by telling me you want another entry! 5. Tweet about this contest on Twitter (Be sure to follow me on Twitter too- see link in my sidebar.). Make sure to leave a link to your twitter message in your comment. You can do this once a day. Please make sure to come back each day and leave another comment with your new twitter message link. Be sure to leave a separate comment for each entry. If you earned two or more entries for a specific item (such as #1 and #4 above), be sure to leave me a comment for each of the entries you've earned. *Enter by 9pm (EST) on Friday, July 3, 2009. I love this entire outfit, and would love to "splurge" a little on everything shown here with a gift card. Thanks so much for the chance to enter!! If I win, I would hold onto the gift card and use it this Fall towards some long sleve dresses for my girls. If I had to pick something from what they have now, I would buy the girls smocked dresses. Children's Place has the cutest winter tights too! I'd get a few pairs of sunglasses! I would choose the purple Braid Trim Dress, along with a lot of other stuff since it's on sale for ONLY $6.74!! Love it! Today I would choose the fisherman water shoes for my 2 year old. the crazy little guy is is still wearing tennis shoes and socks everday. I love The Children's Place jeans so will stock up for the next school year! This would be great! I would buy my son some back to school clothes! I would get the Denim Sash shorts for my daughter birthday on the 4th of July. Thanks for such a wonderful giveaway! I would get my grandkids some of the Graphic Tees that are on sale. I like the Princess,Rock Out,Space and the Dirtboard. Thank you so much! I would buy the Rock Legends Tee for my son. He also needs some sandals and jeans. Thanks!! I would love another entry! I would get the Pink Yoga Halter! That cracks me up! Guess I'll have to get the little one doing yoga now. I would love the sapphire ruffle flare jeans and the ruffle skort. We need pj's, so I would stock up on ones like "tropical bunny stretchie". I would buy their place jeans for my son. I would buy my daughter one of the cute one piece bathing suits! I like their jeans. I would probably get a few for next fall when it isn't 105 degrees outside. I'd get the whole gem of a girl outfit! So cute! Thanks for the giveaway! I would buy the glitter print blue knit dress and the american patchwork dress. So many cute things! I looked through the sale items (to maximize my spending ability) and really like the butterfly graphic tee, cargo pedal pushers and crazy dot lace-up shoes for my daughter. I would get my granddaughters some pj's. Thanks. I'd get my son the hero hound hi-top shoes and camo cargo shorts. Thanks! I'd get the cute Boys' beach hoodie and football jersey! I'm a new subscriber too! The bell-sleeve dress and the knit floral dress. I love the clothes at the Childrens Place! I would buy some of the stretchies...3 for $24.99 is a great price. I like the Cupcake, Girl Neighborhood and Mermaid stretchies. Thanks for the review and giveaway! I would buy the puppy stretchy for my new nephew. definitely the screen t's .